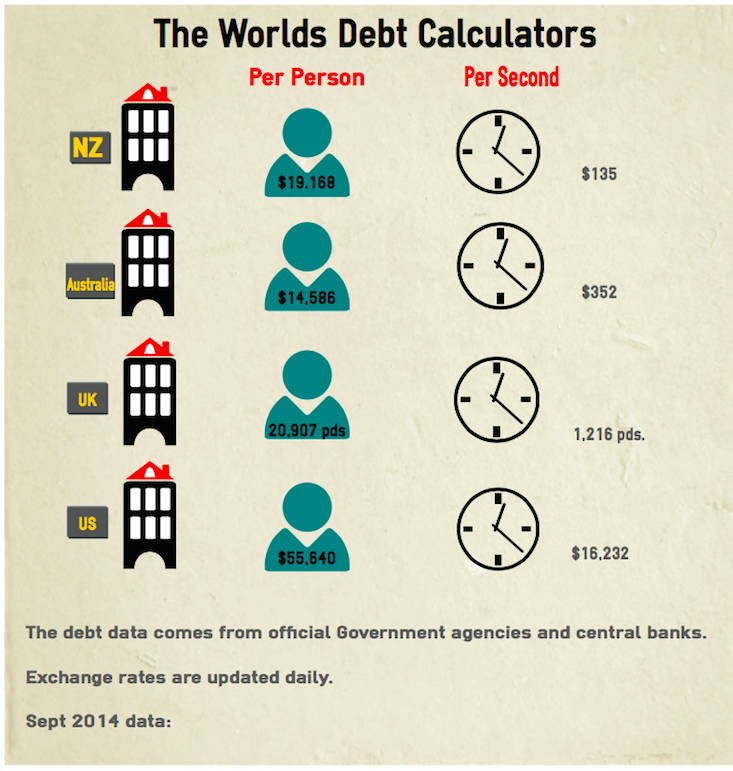 Four Seasons In One Kiwi: National Debt Clock - Whats Your Countries Debt? National Debt Clock - Whats Your Countries Debt? As I type, our county owes $86,873,707,076. By the time I finish this post the country will have clocked up an extra $135 a second - thats right a second - in interest alone. It works out to be about nearly $20,000 per person. Unfortunately the debt calculator widget won't embed itself into this post for now, but you can use this DEBT CALCULATOR link to watch the debt climb in real time. Like a train wreck unfolding in front of your eyes, it has a certain fascination that keeps ones attention locked firmly on the figures as they continue to rise. For those of you who are non Kiwi, you can use this calculator to see the debt and statistics for your own country. The Info-graphic below shows where NZ sits in relation to the UK, Australia, and the United States. The Government is campaigning this election on the fact that they believe under their watch the New Zealand economy is a 'Rock Star'!. Economists acknowledge that whilst the economy has been going well, once the temporary factors that have shot it to stardom start to wane (such as a slowing down of the Christchurch rebuild, rising interest rates and migration to Australia speeding back up) then New Zealand's Rock Star is going to age quickly and need a substantial stint in rehab in order to get back on track. In the meantime, despite the dire warnings to watch debt and spending, the Government unleashes a tax cut bribe that we can't afford. Just in time for the election - how convenient. In addition, one of the policies they want to implement for first home buyers will (according to experts and experience from other countries such as Australia) see house prices and interest rates hike up further. What the clock shows is that New Zealand owes money, and not just a small amount of money but a large chunk. Instead of irresponsible tax cuts perhaps we should be looking at ways to stimulate growth, readdress inequality and invest in innovation. I would rather we invested in the people of this country by ensuring we have an equitable education system, responsive justice and health system and strong, clean and green economy. Tax cuts will have repercussions - more debt for the country and something has to be sold or stripped in order for them to happen. When you vote, ask yourself, is it worth what you will lose? I sincerely doubt it. The Voter - Which Type are You?